"Can public transport be made fully accessible?" by Patrick Nyamurundira, Transport Scotland. - Glasgow meeting of 6 February 2018. After training in his native Zimbabwe as a teacher, Patrick was working in adventure tourism at Victoria Falls when he met his wife who hails from Port Glasgow. 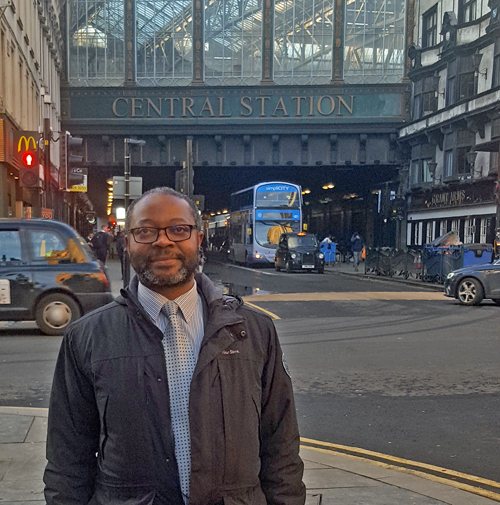 The impact of land-grabbing made staying in his home country unwise, and they moved to Scotland, where he worked in a bank before joining ScotRail initially on the gateline at Glasgow Queen Street Station and then from 2008 as Access and Inclusion Manager (dealing also with transport integration until that role was hived off) until 2017 when he commenced his present secondment to Transport Scotland. Patrick also studied Business and Management at Caledonian University, balancing work, home and studies. Having a disabled sister has helped give him a passion for seeing what difference he could make to the lot of mobility impaired people who might be reluctant to make journeys by rail. The 1995 Disability Discrimination Act and the 1998 Rail Vehicle Accessibility Regulations set the pace for making rail accessible to all, but despite their widespread implications for all aspects of rail operation it became apparent that the message was not getting across that disabled people are welcome on trains, so Patrick has hosted a series of rail awareness days and stakeholder engagements throughout Scotland in which a train is specially parked at a station in order that they may come on board to inspect its layout and hear from frontline staff what rail travel has to offer. First published in 2006, refreshed a decade later and due to be revisited in 2019, Scotland's National Transport Strategy has three strategic outcomes : improved journey times and connections, tackle congestion and lack of integration; reduced emissions to tackle climate change, air quality and health improvement ; and improved quality, accessibility and affordability to give a choice of public transport offering better-quality services and value for money as an alternative to the car. Thus accessibility gets a mention, and Scottish Government policies yield projects to improve both stations and trains. Associated logos include the wheelchair symbol to denote accessible locations, a clouded brain symbol for mental illness including Alzheimer's, hands indicating where signing is available for the deaf and a pictogram of the elderly to advise where drivers and others should take particular account of their presence. There remain severe deficiencies such as the very low platforms at Dunkeld & Birnam where a decision is awaited on A9 dualling - a reminder that improving a station sometimes requires a wider community buy-in. Fortunately sometimes a softer option than major infrastructure investment such as better signage can take matters forward, and there is much merit in accessibility improvements that build an inclusive society, showing professional and responsible leadership to do more than just comply with legislation and codes. Innovation can involve assessing and seeking multiple views to resolve complex issues, skill and understanding of the human life-cycle, a reflection of demographics - by 2034 27% of the working population will be elderly, and unless their needs are met, their business will be lost to rail. Economic growth can be fostered by policies on inclusion, provided that account is taken of environmental and sustainability considerations, and the need to think through what you want to see today, tomorrow and in the years ahead is borne out by the long life of railway rolling-stock. The National Implementation Plan for Britain's railways seeks to achieve unobstructed and obstacle-free access routes within the Network Rail-owned infrastructure, including at least one entrance to each station and all drop-off points associated with that entrance and transfer to all platforms and between platforms. Currently just over five hundred or 20% of all stations have step-free access to all platforms and just over half of Britain's 2500 stations can be said to be usable by most people who require stepfree access. The £370M Access for All programme launched by the Department of Transport in 2006 seeks to deliver accessible routes at 150 British stations, and with a one-tenth share coming to Scotland has provided lifts or ramps at 23 Scottish locations with two more Kilwinning and Kilmarnock due for completion by March 2019 and a commitment to further spend in the 2019-24 Control Period. Additionally 1500 stations 120 of them in Scotland have benefited from smaller access improvements - accessible toilets, automatic doors, variable height counters or tactile paving. Criteria for inclusion in the Access for All programme include footfall weighted by the number of disabled users, geographical spread, third-party match funding, proximity to a school/hospital or interchange, synergy with Network Rail renewals, early deliverability and where possible support to local authority aspirations for socio-economic regeneration. The furthest north locations are Elgin, Dyce and Montrose, all with fully accessible footbridges: inevitably most are concentrated in west-central Scotland because that is where the majority of the population lives, but electrification has provided the opportunity to tackle Livingston South and West Calder, while Forres was made possible by its relocation in the Aberdeen-Inverness upgrading project and Nairn is awaiting confirmation. Aviemore and Pitlochry will be addressed during the Highland Main Line upgrading, and at Stirling the stepped footbridge to Platforms 9 and 10 will be replaced. A rail franchise brings with it licence obligations, and the Equality Act too imposes requirements. Provision of services for disabled people is specified in the disabled persons Protection Policy, some aspects of which such as entitlement to a taxi at stations without stepfree access are insufficiently known. The rail industry has standards and codes of practice, and offers opportunities to highlight best practice. For example it cost just £42k with external funding to develop a passenger assist app using train headcodes ensures that the message reaches the smartphone of the right person on the frontline and stays live until the task is completed. The franchise's committed obligations include the phasing out of trains that do not comply with the Rail Vehicle Accessibility Regulations, a process that has been under way for many years with refurbishments to create accessible toilets. Also included has been the desire to reduce the advance notice period required to 3 hours should one need assistance. Now 73% of passenger journeys are to or from accessible stations, and by 2020 100% of the fleet will be compliant with accessibility requirements. 40% of disabled people who don't use public transport blame lack of confidence in service provision, but 60% have no car unlike 27% of the general population, presenting rail operators with a business opportunity. With more than one-fifth of the Scottish population registered as having a disability, the industry has to do passenger information in a different way. Patrick listed the challenges as funding and sustainability, planning including local authority listed building consents, legislation including building standards which are not the same as in England, encouraging innovation, the changing political and economic environment, the demographics of an ageing population which may pay less tax, competition for available funds from projects like HS2 and Crossrail, priorities including the projected switch to electric self-driving vehicles, wastage if jobs are not properly coordinated, franchise changes and the age of the infrastructure which may place the emphasis on renewals. Many stations on curves would not be located where they are if we were starting again, and gauging for freight clearances can adversely affect stepping distances. There may be emerging issues with the perception of disability and sometimes a risk of over-innovation - for example there have been calls to place a Changing Places toilet in the new Dundee Station, but people reliant on such a facility may sadly be in wheelchairs that cannot be transportable on board a train. Sometimes the cause of difficulty is pure thoughtlessness, such as messages in all upper case that may be unintelligible to people with dyslexia or a learning disability, or customer information screens that are unreadable to those with eyesight issues. Thanking Patrick for sharing his passion with an audience that had come from far afield as London and Aberdeen, past chairman John Yellowlees noted how far society had come from Alf Morris MP's Chronically Sick and Disabled Persons Act 1970, which was the first in the world to recognise and give rights to people with disabilities. Now the world that Patrick has described is one in which the disabled community has moved centre-stage to create business opportunity and drive change.